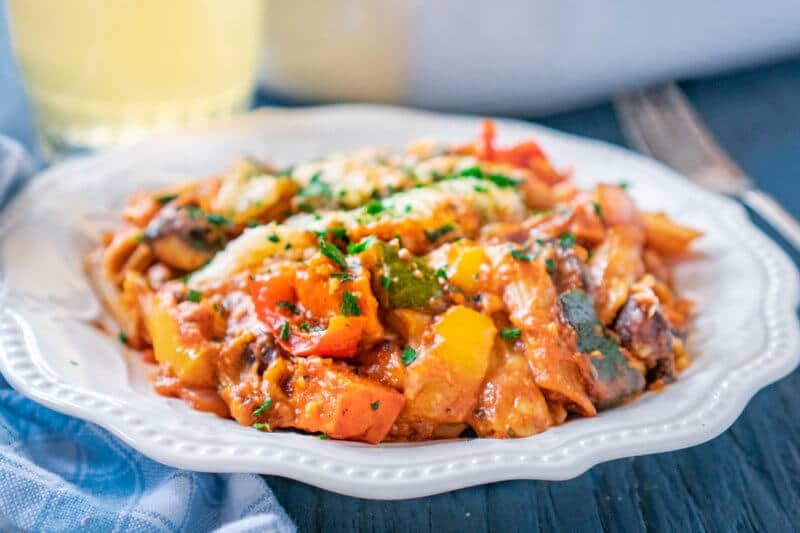 Thank you Modern Table for sponsoring this Vegetable Pasta Bake post. The mighty plant protein puts the nutritious in delicious — check out Modern Table pasta today! 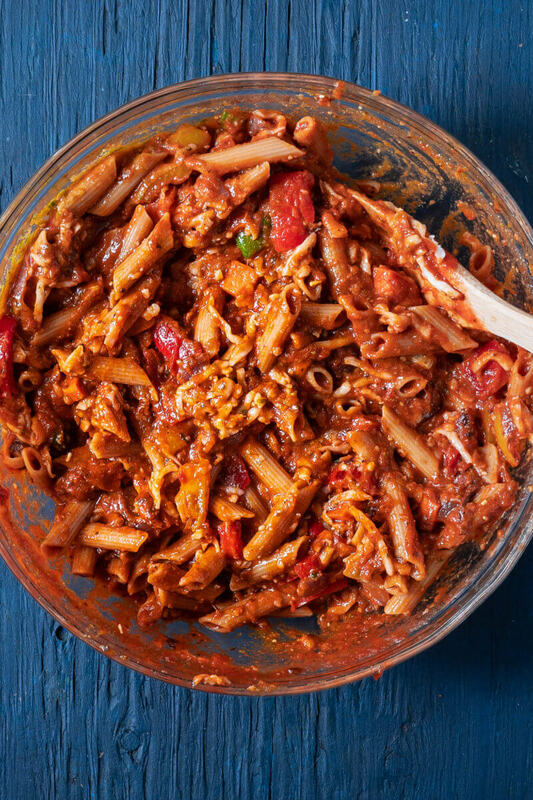 Have you heard of Modern Table Complete Protein Pasta? All their pastas are lentil-based and contain complete proteins – meaning they have the 9 essential amino acids our bodies need for strong energy, good digestion, and muscle health. 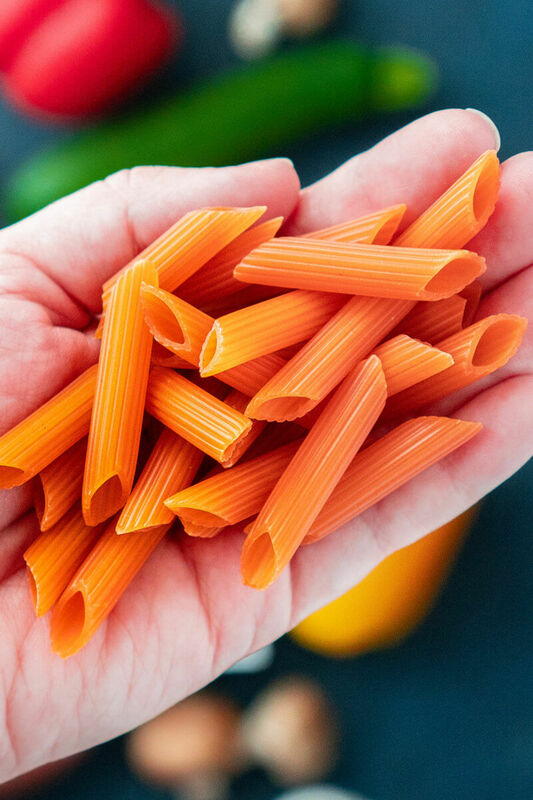 With only three plant-based ingredients, the plain pastas are vegan, non-GMO, and gluten-free. They also come in four shapes: Penne, Rotini, Elbows, and Spirals. So you can use them to create a variety of Instagram worthy pasta recipes. It can sometimes be tough to get my kids to eat enough protein. But they will happily eat a bowlful of pasta. 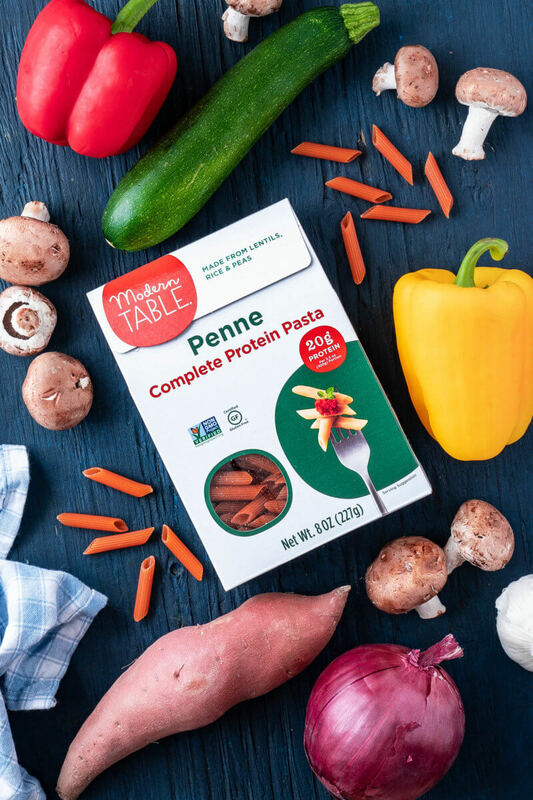 Which is why I was thrilled to connect with Modern Table and learn about their protein pastas. 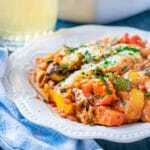 Whether I am making a vegetarian recipe (like this vegetable pasta bake), or they decide to pick around the meat in their pasta, I can know they are getting a good amount of protein. I also have to say, that I felt SO full after eating a serving of this vegetable pasta bake. Not a gross tired full, which often happens right after eating a bowl of traditional pasta. It’s over three hours later, and I still feel satisfied and energized. I can tell I ate a lot of protein, which is exciting because I also ate a LOT of vegetables. If you’d like to give these super star noodles a try, the folks at Modern Table gave us a coupon code. Head to Modern Table on Amazon and use the code 25pastamonth to get 25% off your order! WANT MORE IDEAS TO GET KIDS TO EAT VEGETABLES? TRY PLANTING A KIDS VEGETABLE GARDEN! 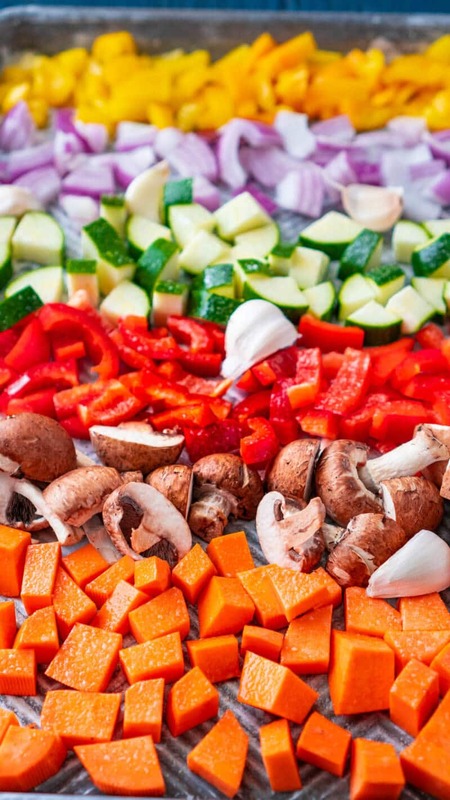 To create this vegetable pasta bake, I wanted to choose a variety of colors for our veggies. I also wanted to stick with vegetables I knew my kids would eat. I decided to use a sweet potato, a zucchini, and a couple of sweet peppers (red and yellow). I also included a few mushrooms, half of a red onion, and some whole garlic cloves. But don’t feel like you have to use the same vegetables I did. You could use chopped broccoli, cauliflower, or carrots. You could even use some frozen peas, or sugar snap peas cut in half. Cherry tomatoes would be wonderful, although you get plenty of tomato from the sauce. Yellow summer squash would be just wonderful. Or maybe some eggplant, asparagus, or green beans. If your family loves spinach, you could even mix in a few handfuls of baby spinach. Just make sure to mix spinach in fresh, don’t roast it. The key to the sweet flavor of this vegetable pasta bake is roasting the vegetables. This makes sure the vegetables are perfectly cooked and seasoned. Roasting also gives them a bit of caramelization. Those are the little brown spots on the vegetables, where their natural sugars are caramelized. To roast your vegetables, start by chopping them into the size that you want. I wanted smaller than bite sized pieces so we could have several different veggies in one bite. Keep in mind that some vegetables will roast faster than others. Harder vegetables like sweet potatoes or carrots should be cut into smaller pieces. I cut them into about a half inch dice. The bell peppers were cut into inch long strips. For the soft vegetables like mushrooms and zucchini, I cut them to about double the size of the sweet potatoes. This way all the vegetables are finished roasting at the same time. Don’t forget to spray your veggies with a bit of olive oil, then sprinkle them generously with kosher salt. You want to season them before you roast them to help bring out their natural flavors. Once the vegetables are done, squish the roasted garlic out of its papery peel. Chop or mash it and mix with the roasted vegetables. Now you’re ready to assemble your vegetable pasta bake. 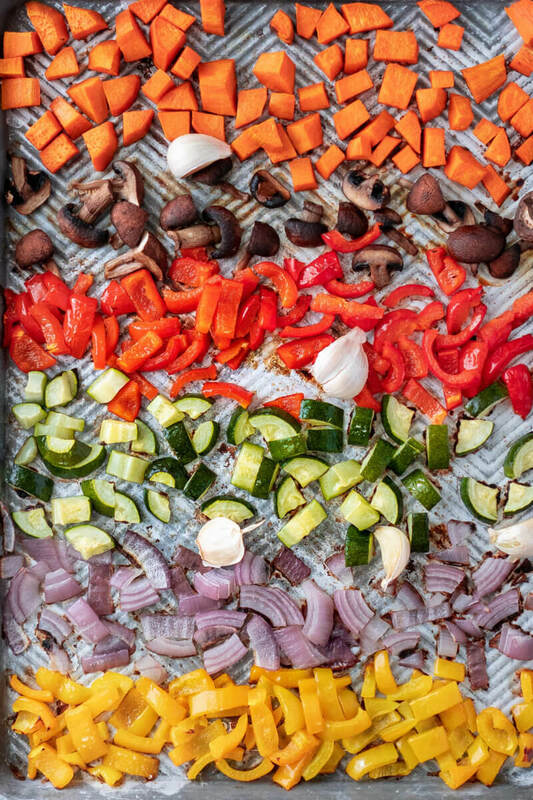 Chop your vegetables and spread into a single layer on a baking sheet. Spray with olive oil and sprinkle generously with kosher salt. Roast vegetables at 450 degrees F for about 20 minutes. While the vegetables are roasting, cook 8 ounces (or 1/2 pound) of Modern Table Penne Pasta. Follow the package directions, but drain the pasta early, after just 8 minutes of cooking. This will keep your pasta from getting mushy when the vegetable pasta bake cooks in the oven. When vegetables are done, squeeze the roasted garlic from its peels and chop or mash. Mix with the vegetables. In a large bowl, mix the roasted vegetables and the cooked pasta. Add 3 cups of marinara sauce, and 1/2 cup of pesto to the pasta and vegetables. You can also sub your favorite pasta sauce. Mix well. Now stir in 1-2 cups of mozzarella cheese. I went with two cups knowing my kids and husband like it cheesy. But you can reduce the amount to lower calories or fat content. Place in the oven and bake at 450 degrees F for 15 minutes. Your vegetable pasta bake is done when the sauce is bubbling and the cheese is melted. A vegetable pasta bake is also a great meal to make in advance. Roast your veggies and cook your pasta, then assemble everything in a baking dish. Just cover the vegetable pasta bake and keep in the fridge overnight. When you’re ready, uncover and add ten minutes to your cooking time (so 25 minutes in the oven). You can also freeze this casserole for bulk cooking. Line your baking dish with plastic or foil before your pour everything in. 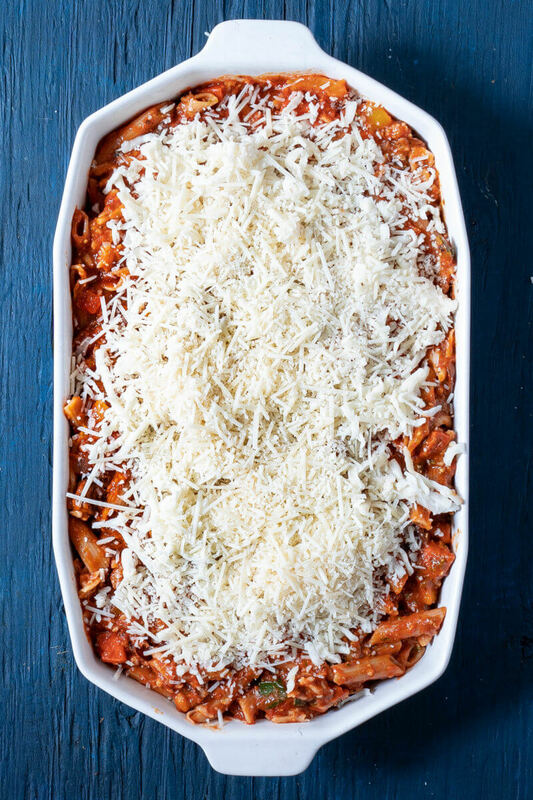 Assemble the vegetable pasta bake in the lined dish, cover, and freeze until solid. Once the whole thing is solid, you can remove it from the baking dish. Just keep the casserole wrapped up in your freezer. Then your baking dish can be used for other things. When you’re ready to eat the vegetable pasta bake, simply unwrap and place in the baking dish. At this point you can thaw it in the refrigerator, and bake for 25 minutes once it’s thawed completely. You can also cover the dish with foil and bake in the oven for 45 minutes. Then remove the foil and continue cooking for 15 more minutes. PIN TO SAVE SO YOU DON’T LOSE THE RECIPE! 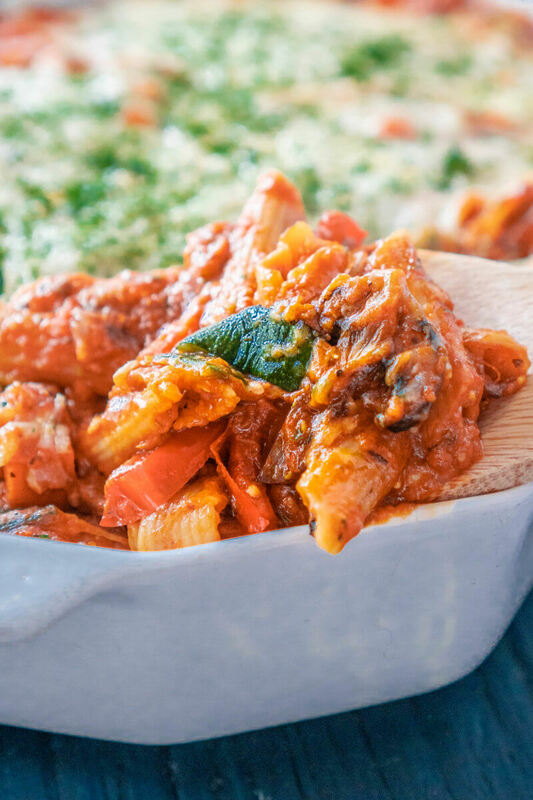 We hope you enjoy this vegetable pasta bake as much as we do. Make sure to save it to Pinterest so you don’t forget it! You can also leave a photo in the comments of the pin when you make the recipe. We love seeing your cooking! Cook pasta according to package instructions, but drain 5 minutes early. Noodles will continue cooking in the casserole. 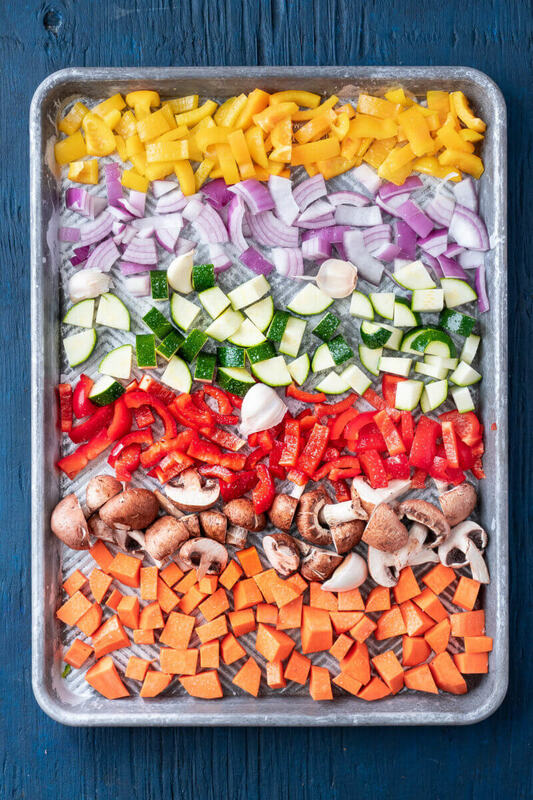 Chop your vegetables to slightly smaller than bite sized pieces and arrange in a single layer on a baking sheet. Leave garlic cloves whole in their peel. Spray with olive oil and sprinkle with salt. Roast vegetables at 450 degrees F for 20 minutes, until tender and lightly caramelized. 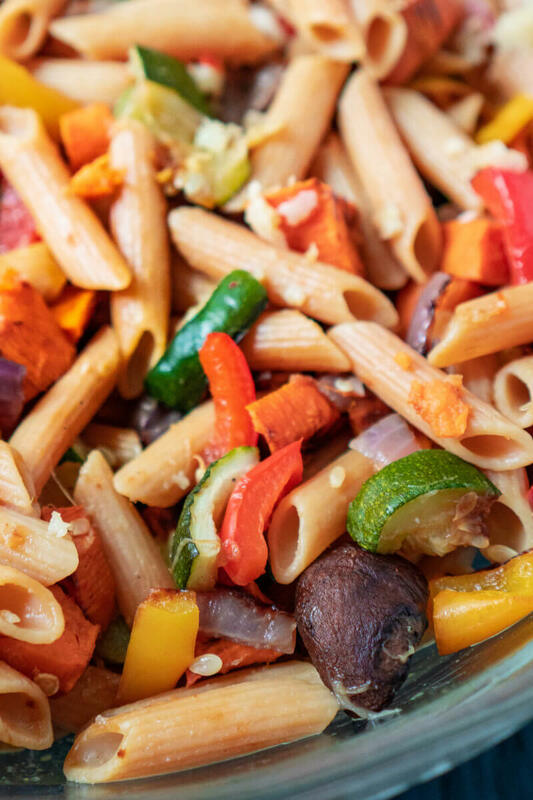 Mix roasted vegetables with cooked pasta in a large bowl. Add marinara sauce and pesto sauce to pasta and vegetables. Mix well. Mix in two cups of mozzarella cheese. Pour the mix into a baking dish. 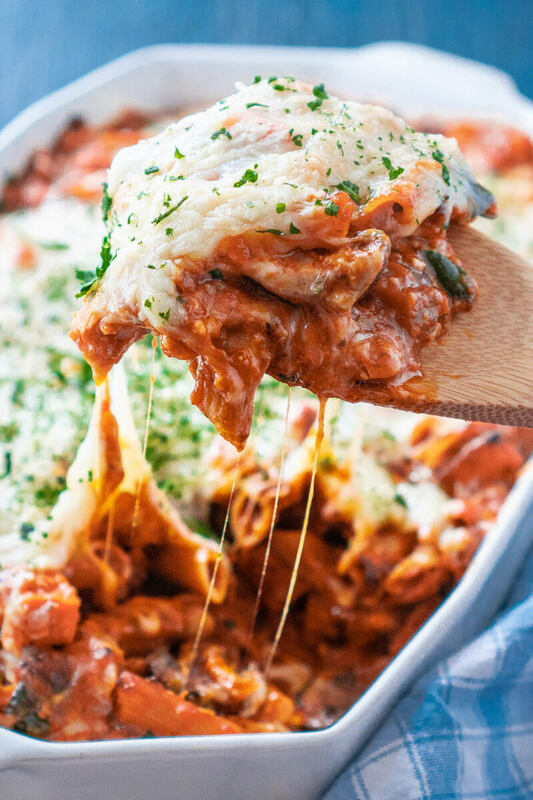 Top vegetable pasta bake with 1 cup mozzarella cheese and 1/2 cup Parmesan cheese. Bake uncovered for 15 minutes at 450 degrees F. Casserole is done when cheese is melted and sauce is bubbling. Sprinkle with chopped parsley before serving for a pop of color. If you'd like to make the casserole in advance, follow all the steps up until cooking the complete casserole. Cover and refrigerate. When ready, cook 35 minutes at 450 degrees F.
If you'd like to freeze the casserole you can thaw before cooking and cook for 35 minutes at 450 degrees F. Or you can cook from frozen. To cook from frozen, cover with foil and cook 40 minutes at 450 degrees F. Then uncover and cook another 15 minutes until cheese is melted and sauce is bubbling. I love lentils….so I need to give this pasta a try. We prefer gluten-free pasta to regular pasta. This sound like a flavourful that would make great leftover too. 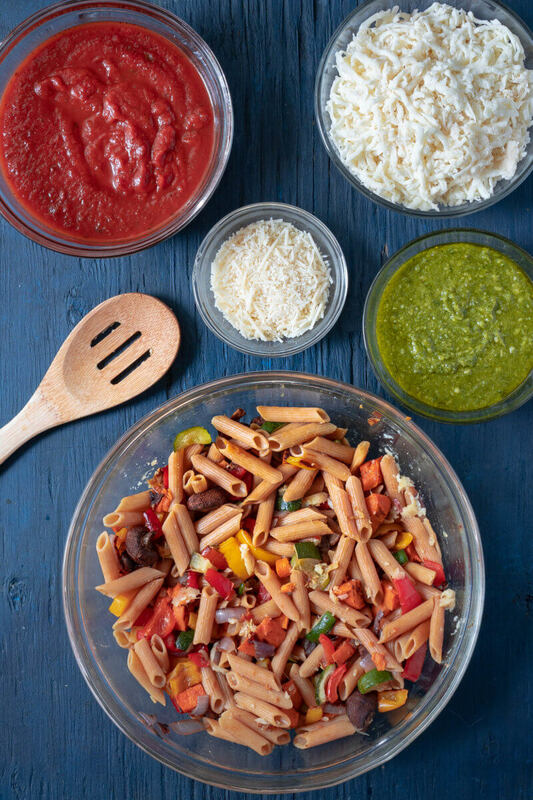 oh I love this idea with vegetables this pasta is bursting with healthy delicious flavors everyone will love here! What a beautiful, flavorful vegetable pasta bake! I love that it’s colorful, healthy and easy to make. I LOVE this pasta and how they make it with lentils and all the protein! Such a great option for vegetarians or anyone looking to up the protein in their diet – especially in a delicious dish like this! Excellent recipe! Wow, plenty of fresh vegetable with different color tones are added in this recipe. Most importantly, this recipe did not forget about the protein sources too, well, it has adopted lentil which is great source of protein. I like this for a big gathering party. I’m going to save this recipe to cook for my family. They will love it. What a colorful and absolutely delicious looking dish! This looks so delicious! I’ll have to give it a try soon! What a great dish! 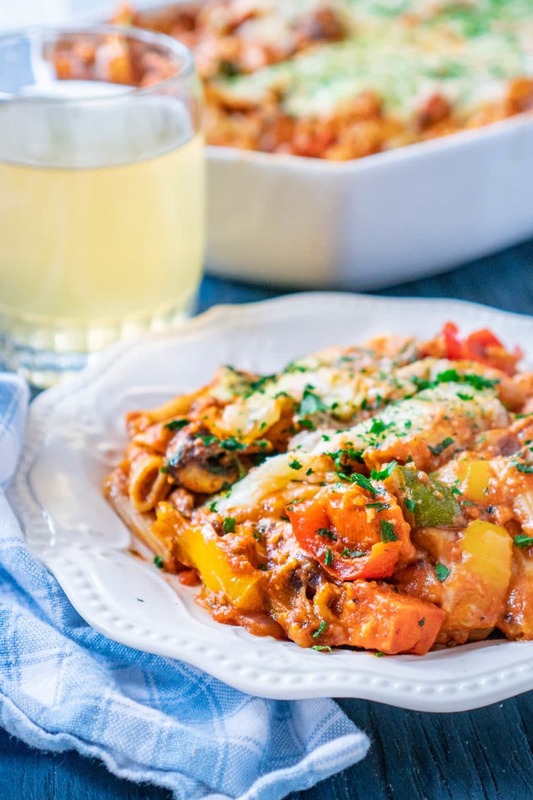 I looooove roasted veggies, and love how you’ve combined them with a yummy baked pasta! I’ll be on the lookout for this pasta! My family would love to have this. The recipe looks pretty easy to follow too! I’m saving this recipe to my Yumprint cookbook. I’m always looking for new veggie pasta dishes to make. I especially love using roasted veggies in my dishes. My kid never says no to pasta. This version is so perfect for him! I love how packed with veggies this pasta is! Ok. Its lunch time and the delicious pictures have got me craving roasted veggie pasta. Yumm! I love that this is gluten free! What a fabulous way to get in extra veggies too! 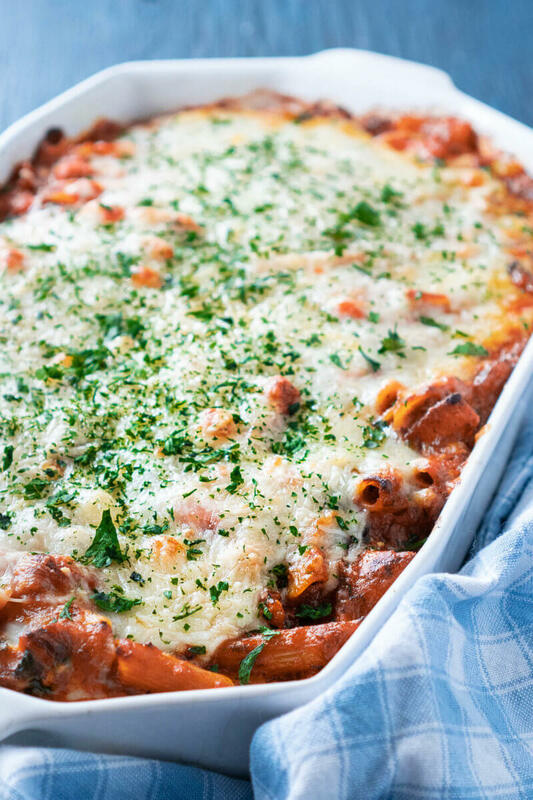 Your pasta bake looks warm and comforting…perfect Autumn meal for the family. You are absolutely right! Roasting the vegetables brings so much flavor out in them. I can imagine how good everything tastes combined with a delicious tomato sauce and a yummy gooey cheese on top. This I know would be a favorite at our house. Roasted vegetables in any dish are always a plus and i’m a sucker for a good pasta dish. I really appreciate how this is vegetarian too. Thanks for sharing. I love pasta. I will try to make his as soon as possible. Great dish . Thanks for sharing. You said its gluten-free? I am sold! I also like the way you arranged these ingredients and the final result.